Homicide investigators are seeking the public’s assistance identifying who killed a Malton woman, leaving behind a child without a mother. 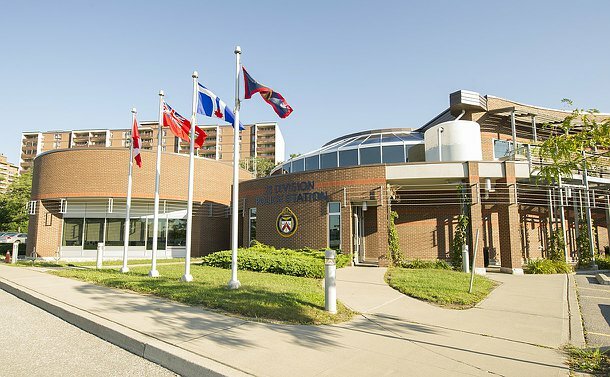 23 Division station, located at 5230 Finch Ave. W. at Kipling Ave.
Candice Rochelle Bobb, 35, who was five months’ pregnant, was pronounced dead shortly after suffering gunshot wounds while travelling in a vehicle in the city’s west end. An emergency caesarian section was performed. The baby has been reported to be in critical, but stable, condition. At a news conference at 23 Division on May 16, Detective Sergeant Mike Carbone said Bobb and two individuals travelled in a vehicle to the Jamestown Crescent & John Garland Blvd. area, where they picked up another person. The quartet then attended a basketball game in the city’s east end, where one of the individuals was a participant. At the end of the game, they drove back to the Jamestown Crescent & John Garland Blvd. area to drop off one of the occupants. While the vehicle was stopped, shots were fired at the vehicle. Bobb was seated in the back seat. None of the occupants exited the vehicle and the driver sped away to a hospital where attempts by medical staff to revive the victim were unsuccessful. Carbone said the vehicle was targeted. “Having said that, on the information we have available, this is all we can say at this time,” he added. He appealed to anyone with information, or who had recorded video footage in the area, whether from their home or their vehicle, to come forward to police. Superintendent Ron Taverner, the 23 Division unit commander, said the shooting is a cowardly act and he is appealing to the suspect(s) to turn themselves in. Anyone with information is asked to contact police at 416-808-7400, Crime Stoppers anonymously at 416-222-TIPS (8477), online at 222tips.com, text TOR and your message to CRIMES (274637). Download the free Crime Stoppers Mobile App on iTunes, Google Play or Blackberry App World.